Strengthening our leadership position in immunoassays, Enzo Life Sciences now offers CRP ELISA Kit – a rapid ELISA for the detection of the C-reactive Protein. C-Reactive Protein (CRP) is a pentraxin family protein that is widely used as a biomarker for systemic inflammation and tissue injury. Its primary role in innate immunity is to function as an opsonin for pathogens via activation of the complement pathway and through binding to Fc gamma receptors. In response to infection, the serum CRP concentration can increase by up to 1000 fold. Elevated CRP levels have been reported in patients with infection, chronic inflammatory disorders, myocardial infarction, pulmonary disorders, atherosclerosis, cancer, metabolic syndrome, and depression. The CRP ELISA Kit can be used to quantify human C-reactive protein in serum and plasma samples. This sensitive assay is fully quantitative, with the ability to detect as low as 12.625 ng/ml of C-reactive protein, surpassing semi-quantitative Western blot analysis. This assay produces rapid results in just under 2 hours with negligible reactivity to similar family member, human serum amyloid P component. 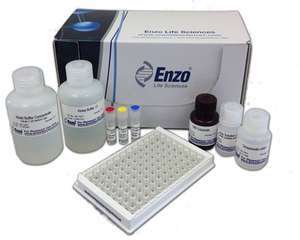 For more information, or to order the CRP ELISA Kit or other Enzo Life Sciences products, please visit us at www.enzolifesciences.com or call us at 1-800-942-0430.